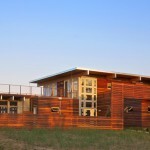 SIP buildings have been proven to reduce energy costs by up to 50%, or more, when compared to conventional structures. The figures above are tested R-values of the individual components. The number used for the R-value of the 7/16” OSB is .55. This data is from the APA. The R-value data for the EPS core is provide by Porter Corp’s EPS suppliers. This data was developed by testing in accordance to ASTM C578. The figures above are based on the R-value per inch of thickness and are then multiplied by the thickness of the core of each panel’s size. 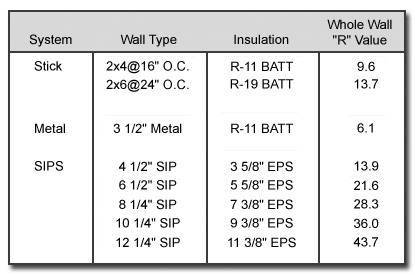 The whole wall R-values is a measure of thermal resistance used by Oak Ridge National labs to determine real-world R-value of wall assemblies. Under uniform conditions, the R-value is the ratio of the temperature difference across an insulator (a wall or roof) and the heat flux (heat flow per unit area) through it. The bigger the number, the better the building insulation’s effectiveness. In real-world conditions, stick built walls typically have studs 16” O.C. Each of these studs is a through thermal conductor. When SIP walls and stick built walls are compared in the real world condition of the whole wall R-value test, SIPs are proven to be much better performers. See the chart below. Click here for the Whole Wall R-value study. The superior performance of SIPs comes from their inherent air-tightness as well as their good R-values and the lack of thermal conducting studs. Oak Ridge National Labs also ran a test comparing SIP wall assembly air-tightness to stick-built wall assembly air-tightness. 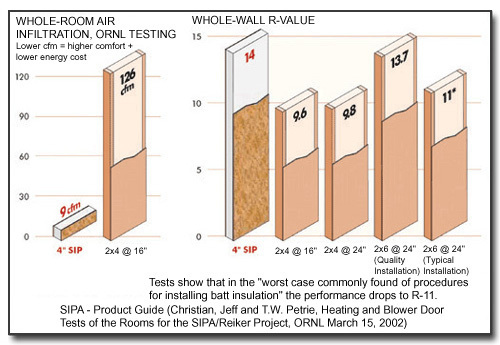 ORNL found the SIPs had 93% less air-leakage a comparable stick built wall assembly. See the chart below. Click here for the ORNL air infiltration report.